MSV: Hoboken411's Perry Klaussen beseeches Lane Bajardi: Help Me! 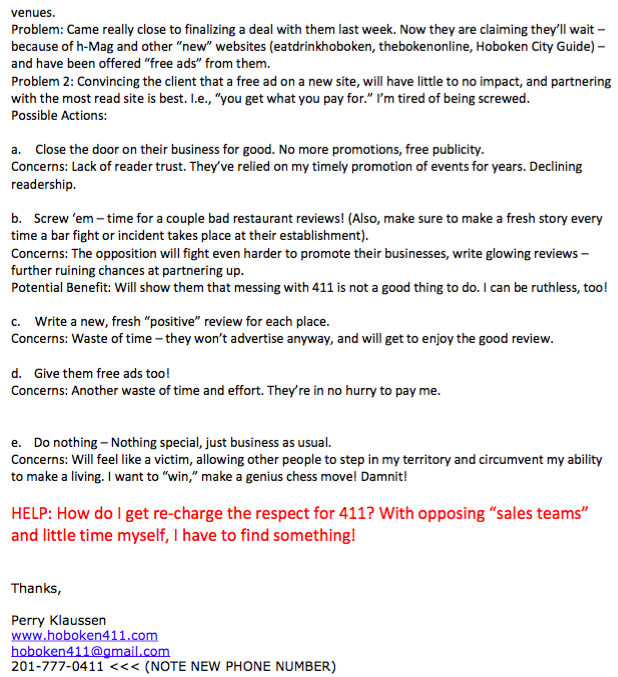 Hoboken411's Perry Klaussen beseeches Lane Bajardi: Help Me! 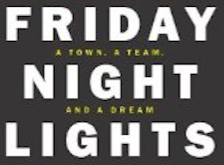 The weekend is almost upon us which means it's time for another episode of Friday Night Lights and a peek into the almost 50,000 email stash obtained in the frivolous SLAPP-suit supported by Beth Mason. That SLAPP-happy civil litigation, Bajardi v Pincus produced a First Amendment bonanza of truth giving the Old Guard much agita and driving Beth Mason from even attempting to hold onto a council seat. In 2009, MSV was among a number of other notable websites gaining traction with one, H-Mag eventually becoming the number one lifestyle website in Hoboken. Perry Klaussen feeling the heat, turned to his ghostwriter Lane Bajardi who wrote almost all of his political content for help on his floundering advertising efforts. 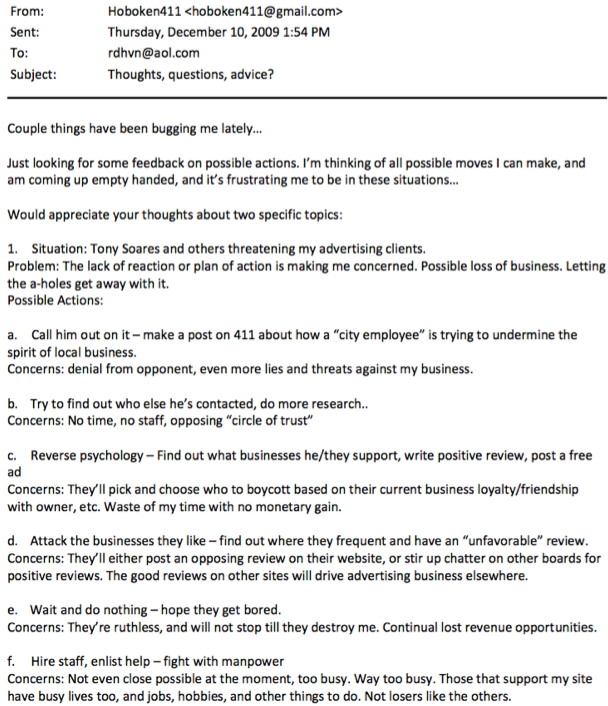 Among the proposed ideas, the Hoboken411 hate machine ponders posting nasty reviews to make businesses pay for not bucking up greenbacks. 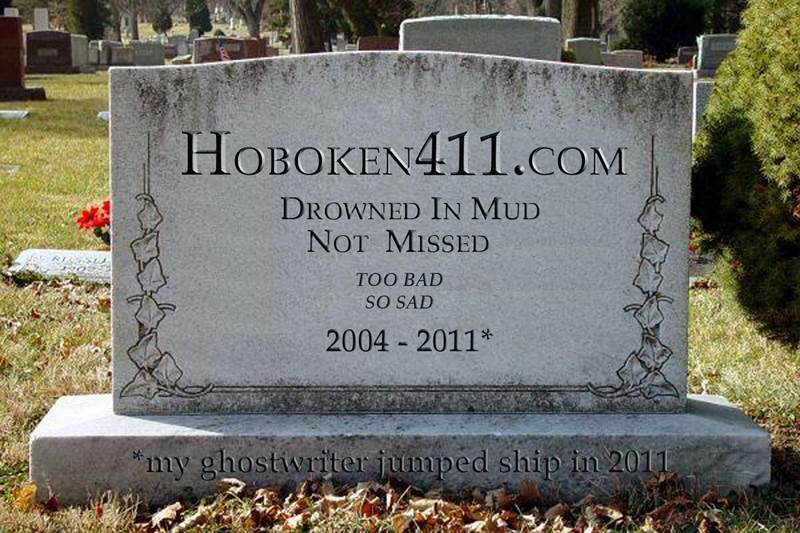 Some legal beagles say there's a hunt underway for Hoboken411 among its ranks. Perry Klaussen has not been seen scrounging for free food out of his usual uptown haunts or with his dog in months. Rumors on the street say Perry Klaussen left an 10th Street apartment earlier and may have evacuated Hoboken entirely in the fear of Hoboken residents he handed private registrations to Beth Mason political operatives. Some were among the dozen residents SLAPPed in the Beth Mason publicly backed frivolous litigation and could seek legal retribution in a SLAPP-back civil action. There's time for Klaussen to be tracked down but in the meantime he's nowhere to be found, other than the babbling rants seen in this complete, unedited 2009 email. Perry Klaussen pleads how he can "re-charge" respect for Hoboken411? Way too late for that. Beth Mason and her minion took care of that a while ago. Related: Popular uptown eatery, the Elyssian Cafe had suffered a fabricated attack from the Hate411 sewer Beth Mason calls her "favorite" newsite. They're doing better than ever.